The day after Sen. Jeff Flake announced he would not run for re-election, citing his dismay over President Donald Trump and the state of the GOP, the Arizona Republican acknowledged Wednesday that his decision came after he realized he wouldn't be able to win a GOP primary. "The bottom line is if I were to run a campaign that I could be proud of, and where I didn’t have to cozy up to the president and his positions or his behavior, I could not win in a Republican primary," Flake told MSNBC’s "Morning Joe." "That’s the bottom line." Trump wasted no time in hitting the outgoing lawmaker on Twitter. "The reason Flake and Corker dropped out of the Senate race is very simple, they had zero chance of being elected. Now act so hurt & wounded!" the president posted moments after Flake's comments. Flake, whose passionate speech Tuesday to announce his decision reverberated across both parties, was responding to questions on why he wouldn't stay in the Senate and fight Trump there, instead of just leaving politics. Trump added, "The meeting with Republican Senators yesterday, outside of Flake and Corker, was a love fest with standing ovations and great ideas for USA!" — a reference to a Senate GOP lunch on Tuesday that he attended — and mocked Flake. Later in the day, Trump told reporters that Flake "would have never won" because "his poll numbers are terrible." "I don't blame him for leaving, I think he did the right thing for himself," Trump added. In answering, Flake signaled that his views as a dedicated conservative simply didn’t align any longer with those of many of his constituents — especially when it came to the issue of standing with Trump. "It's not that you just have to be with the president on policy — you can’t question his behavior and still be a Republican in good standing, apparently, in a Republican primary," Flake said. "In poll after poll, you’ll see a majority of Republican primary voters, kind of a subset within a subset, are firmly behind the president’s policies … and if you ask them as a whole what their most important policy item is, it's, 'Are you standing with the president?'" he continued. 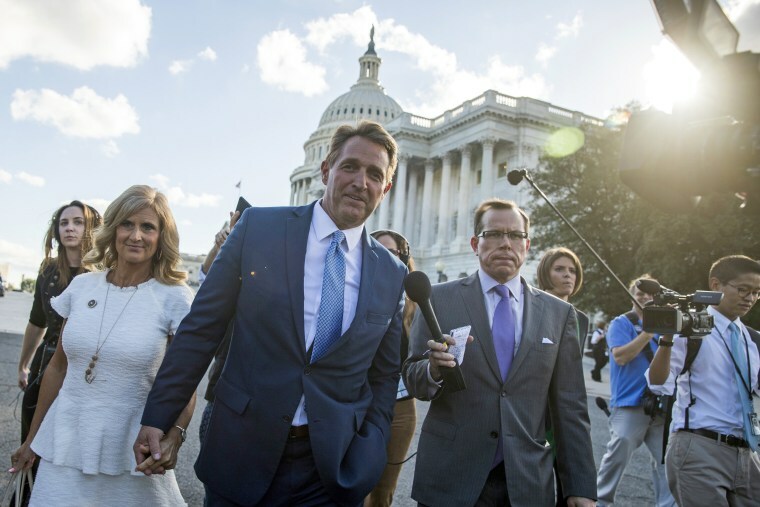 An outspoken critic of the president, Flake faced a tough nomination battle next year against former state Sen. Kelli Ward, a firebrand conservative who is backed by former Trump strategist Steve Bannon. And despite the plaudits Flake received for his speech, his approval rating at home has hovered below 20 percent in recent months. Flake, in his announcement Tuesday to not run, said on the Senate floor, "We must stop pretending that the conduct of some in our executive branch are normal." "They are not normal," Flake said, adding that he would not be "complicit and silent." Trump, for his part, insisted during remarks to reporters Wednesday that he gets a bad rap. "I think the press makes me more uncivil than I am," Trump said when asked if he needed to be more civil. "People don’t understand, I went to an Ivy League college, I was a nice student, I did very well, I'm a very intelligent person," Trump, a graduate of the Wharton School of the University of Pennsylvania. "I think the press creates a different image of Donald Trump than the real person."